Should My Heat Pump Have Ice on it? If you are using a heat pump to keep cool this summer, and happen to notice ice forming on it, call for repairs as soon as possible. This may seem like a sign that your heat pump is cooling your home properly, but it is not the case. In fact, heat pump ice is a sign of a serious issue that can cause a full breakdown if you aren’t careful. Let’s take a look at what causes heat pump ice, and the damage it can do. Posted in Heat Pumps | Comments Off on Should My Heat Pump Have Ice on it? A Heat Pump Can Cool, Too? If you are unfamiliar with heat pump systems, you may be hard-pressed to believe that anything called a “heat pump” can heat and cool your home in St. Augustine, FL. Not only can a heat pump cool your home, it can do it effectively and efficiently, but to do so requires expert installation and service. The AC professionals at Climate Masters can help you with all your heat pump needs – all you have to do is contact us! Posted in Air Conditioning | Comments Off on A Heat Pump Can Cool, Too? The heat pump… a remarkable machine. The heat pump uses a simple concept—basically, creating a reversible air conditioner—to give homeowners a two-in-one answer to their comfort needs. During the summer, you set the heat pump to cooling mode, and just like an AC it cycles refrigerant through an indoor and an outdoor coil to remove the heat from your home and place it outside. But when colder weather comes along (or as cold as it gets in Florida), you set the heat pump to heating mode, and now the refrigerant direction reverses. Presto! Heat moved from outside and brought inside. Heat pumps have some disadvantages, but a heat pump for your home in St. Augustine, FL will experience almost none of them. That’s why we think they’re great choices for installation here. To schedule an appointment for quality heat pump installation, call Climate Masters today and speak to one of our heat pump specialists. You already know the main advantage of a heat pump: it takes care of the jobs of both a heater and an air conditioner. That’s money saved and space saved. And heat pumps hook up to the existing ductwork for your air conditioner (and furnace, if you used one), making them easy to install for professionals. If you don’t have ducts, the heat pump has you taken care of as well: ductless mini split heat pumps need no ductwork at all. A specific reason that heat pumps are such good ideas for Florida is because of our climate. First of all, during cooling mode, the process of heat absorption along the indoor coil also removes moisture from the air, helping to control humidity. Second, heat pumps do not encounter a problem they often face in cold climates: struggling to extract sufficient heat from outdoors during heating mode. In places where the temperatures can drop well below freezing, a heat pump will lose efficiency. In Florida, however, we almost never have this problem. Heat pumps are ideal no matter the time of year. Finally, heat pumps offer savings on your heating bill. You’re used to your AC costing less to run than a furnace or a boiler. That’s because those heaters must burn fuel to create heat. But a heat pump is just like an AC: no fuel burnt to create heat, only a small amount of electricity to run the mechanical parts so heat can be moved. An average family of four can save up to 30% on their heating bills each year if they switch to a heat pump. Sounds Great! When Can I Get One? We need to slow you down a bit. Heat pumps are fantastic choices for home comfort… but they still won’t work for every home. Call on Climate Masters today to find out about how well a heat pump in St. Augustine, FL will work for you. 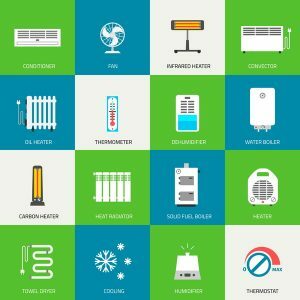 Why Does a Heat Pump Need Refrigerant? Living in St. Augustine means long, humid summers and mild but occasionally stormy winters. In this climate, a heat pump offers many advantages as a solution to your year-round comfort requirements: it provides effective air conditioning during the hot weather, and energy-efficient heat for the shorter cold weather season. If you know something about how a heat pump operates, then you’ll know that it uses a chemical compound known as refrigerant. We’ll explain in this post why a heat pump needs something called “refrigerant” even when it is in heating mode. If you are thinking of having a heat pump installed, or if you need heat pump maintenance and repairs in St. Augustine, FL, contact Climate Masters for quality service today. Refrigerant is a generic term for the mixture of chemicals that allows for the heat pump to move heat from one location to another, which is called heat exchange. In the earliest days of air conditioners, refrigerant was often a toxic or combustible chemical like ammonia or methyl chloride. Modern heat pumps and ACs use safer compounds (known as “blends”); the most common blend in use today is R401A, which has no ozone depletion issues. Refrigerant changes easily between being a liquid and a gas, which is why it is useful for heat exchange in a heat pump. As the refrigerant flows through a heat pump, moving from the outdoor to the indoor coils, it absorbs and releases heat as it switches from a liquid to a gas. During heating mode for a heat pump, the refrigerant absorbs heat from the outdoors (evaporation) and then releases it indoors (condensation). A compressor serves as the “motor” for the refrigerant, compressing it into a high temperature gas at the beginning of the heat exchange cycle. Refrigerant remains at a fixed level inside a heat pump. The process of evaporation and condensation does not use it up. However, leaks can develop in the compressor or along the refrigerant line, causing the level of refrigerant (its “charge”) to drop. This will adversely affect the heating and cooling capability of the heat pump. It requires a professional to seal the leak and recharge the refrigerant. If you have trouble with a heat pump that is either struggling with heating or cooling, than a refrigerant leak may be the issue. Call on repair experts like Climate Masters to handle it. We can attend to any troubles that might pop up in your heat pump in St. Augustine, FL, anyS time of the day or night. Posted in Heat Pumps | Comments Off on Why Does a Heat Pump Need Refrigerant?